David A. Seehaver, age 60, of the Town of Sheboygan Falls, WI, passed away peacefully Tuesday morning (Jan. 15, 2019) at his home. He was born on January 5, 1959 in Sheboygan Falls, WI, a son of the late DuWayne and Evelet (Burkhardt) Seehaver. Dave attended Sheboygan Falls Grade School and graduated from Sheboygan Falls High School in 1977. On October 7, 1988 he married Carrie Morgan at St. Mary’s Catholic Church in Sheboygan Falls. Dave worked at Richardson Company in the Richco Division for 30 years. 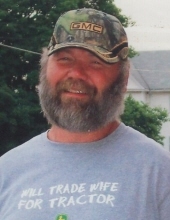 He was a member of the Johnsonville Rod and Gun Club and enjoyed fishing, riding his John Deere and spending time in his garage with his many friends. His greatest joy was always lending a helping hand for his friends and family. Survivors include: His loving wife: Carrie, Four sisters: Tina (Dan) Nowack, Tami (Dave) Langenfeld, Susan Shillingowski and Nancy (Paul) Pittman. Mother and Father-in-law: Leo and Joyce Morgan, Two Brother-in-laws: Bob (Connie) Morgan and Randy (Debby) Morgan. His faithful companion: Milo. He is preceded in death by his parents, step-father, Melvin Michaelson, fraternal and maternal grandparents, and his faithful companions, Willy and Reggie. Funeral services will be held on Tuesday evening (Jan. 22, 2019) at 6:00 P.M. at the Suchon Funeral Home in Plymouth. Pastor Dale Miller, Pastor of Salem Plankroad United Church of Christ will officiate. Burial will be in the Sheboygan Falls Cemetery. Visitation will be held on TUESDAY at the Suchon Funeral Home from 3:00 P.M. until the time of services. In lieu of flowers, a memorial fund is being in Dave’s name for the Sharon S. Richardson Hospice. Special thanks to all his friends; Warren and Annie, Natalie, Joe, Bill, Janine, Curti, Sherry, Bob and Jodi, Ken and Carol and Bob and Julie, Steve, Rose, Carl, Joan, Mark, Wendy and Dan. Also to the Vince Lombardi Cancer Center, Dr. Kumar, Debbie Gray ( Nurse Navigator) and all of the staff, Sheboygan Cancer specialist: Dr. Mark Bettag, Therapists Sherry and Melissa at Rocky Knoll Health Care Facility and the Sharon S. Richardson Hospice for all the care and compassion given to Dave. To send flowers or a remembrance gift to the family of David A. Seehaver, please visit our Tribute Store. "Email Address" would like to share the life celebration of David A. Seehaver. Click on the "link" to go to share a favorite memory or leave a condolence message for the family.